So the fiancé picked up some gorgeous raspberries from “The Berry Guy”, and I got to do something with them. An excellent plan. Just like I did for my Gluten-Free Roasted Rhubarb & Strawberry Polenta Cake, I opened up Nigel Slater’s Tender, Volume 2 (it’s the fruit book, Volume 1 is the veggie one), and thought I’d go looking for ideas to make my own. 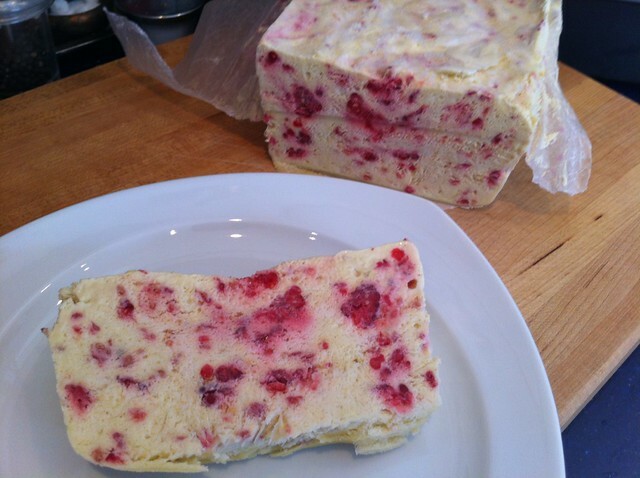 I saw “A frozen ice of raspberries and cream”, and had to make it. 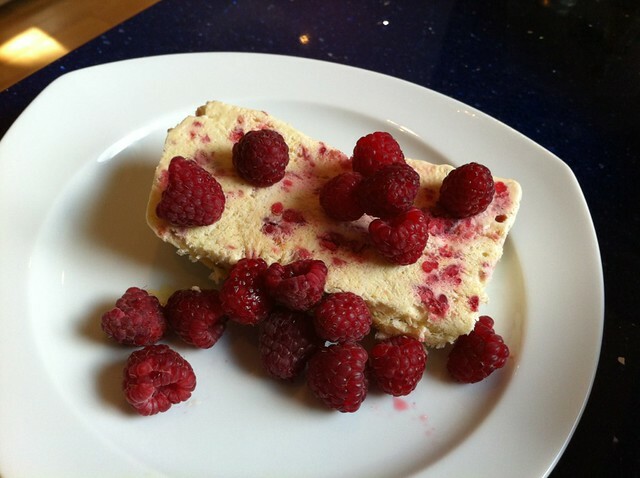 With just a few more raspberries, of course. It’s an ice cream that you can make without an ice cream machine (Huzzah!!! Ice cream for all!!!) — you make it in a loaf tin, and then take it out and slice it to eat it. It’s not as creamy as ice cream that’s churned, so I’m calling it an Ice Slice. Whatever you call it, it’s delicious. Line a loaf pan with wax paper or cling film. Separate the egg yolks from the whites. In an electric mixer or bowl with a whisk, combine the sugar and egg yolks and beat until the mixture is pale and thick. Stir in the vanilla. In a separate bowl, whisk the cream until it is thick, but not whipped; it should still slide in the bowl when you tilt it. Fold the cream into the sugar/yolk mixture. In yet another bowl, beat the egg whites until they are stiff. 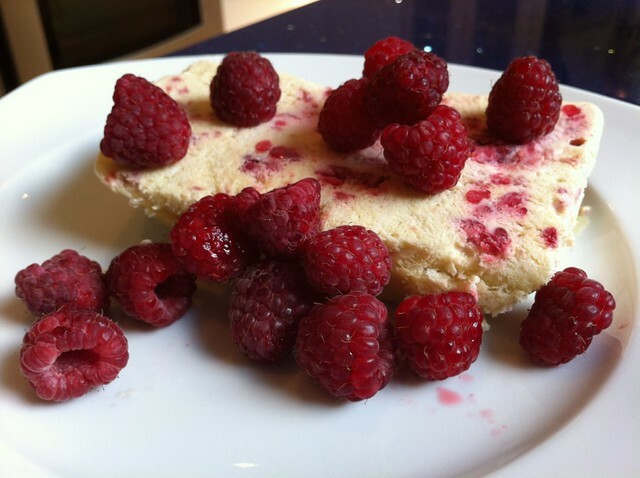 Fold them into the cream/sugar/yolk mixture, then gently fold in the crushed raspberries. Pour the ice cream mixture into the prepared loaf pan. Level it out by tapping the loaf pan on the counter. Cover with cling film and freeze for a minimum of 4 hours, until the mixture is frozen. It works especially well frozen overnight. When you’re ready to eat, remove from the freezer and loaf tin, and use a chef’s knife to slice into thick slices. 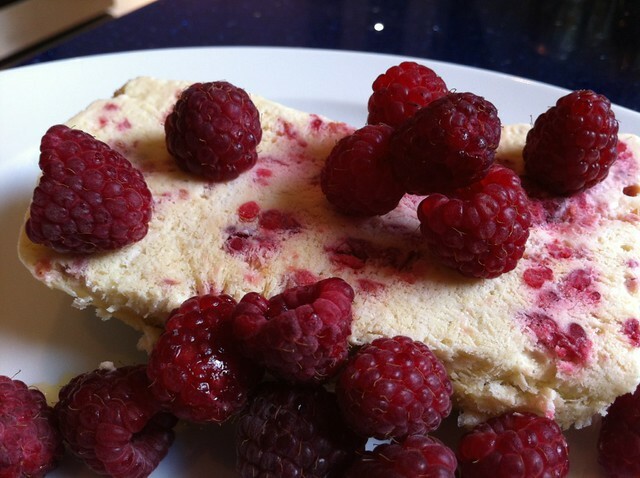 Top with raspberries and eat with delight. I imagine you could use beaters to fluff it up intermittently during the freeze for a creamier fluffier ice cream.. But seriously, this looks delicious and I’m hoping we can find a Berry Guy of our own at the Baton Rouge farmer’s market! !